You’ll recall the €22.9million that Ireland is contributing to the €3billion the European Council is giving Turkey to “stem the flow of migrants to Europe”. 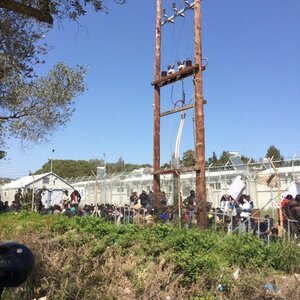 The refugees that arrived Wednesday at Platanos Camp, were soaking wet and in shock because, as they explained to us, the Turkish coastguard tried to force them to return to the Turkish coast with the use of threats, by creating artificial waves and by the extensive use of water cannons. 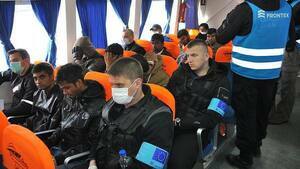 Two of the boats returned to the Turkish coast with all the passengers in shock. The remaining two boats managed to break through and reached Skala Sykamias, Lesvos. [On Thursday] at 3 o’clock in the morning, the Greek Coastguard attempted to stop a new boat from reaching the coast at Skala Sykamia resulting in havoc, and the boat almost crashed on sharp rocks. The accident was prevented at the last moment by the intervention of the rescue boat belonging to the team ‘Sea Rescue’. 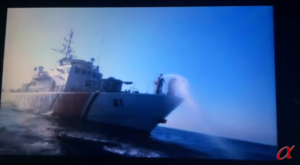 [On Thursday] morning, the Turkish coastguard was sighted from the ‘Korakas’ Observation Post repeating its deliberate attacks against boats in the middle of the sea, again by the use of water cannons. Posted in Misc and tagged lesbos, turkey, Water cannon at 11:36 am on February 19, 2016 by Broadsheet. Shocking, is this the real reason why so many drown? Can’t see the problem with this. Stop entering Europe illegally and this won’t happen. Yea, let’s gas them, or we can put them in camps, then gas them in the camps. We can tell them it’s a shower, and bury them in mass graves, come on what could go wrong? Then we could take any others who manage to get in and put them in a special ‘ghetto’ then we can transport them to the camps, and gas them too! It’ll be great! Holocaust references! Really. So you think people making it to Turkey, a non war zone although not entirely a great place, then the same people leaving the non war torn country to entry Europe illegally is the same as Jews being rounded up and murdered are the same thing. No I just think it would be great if we all banded together behind one angry man who could help us direct out anger and then dress up in cool uniforms and collect up and gas all the people society doesn’t want. Oh right sorry, yeah I’m up for that. Drown those women and children who are escaping from their homes being bombed by numerous aggressors. Some day you’ll need someone’s help and sympathy but you won’t deserve it. Don’t forget the gas! And a train, we can put them on a really harsh train ride on the way to being gassed. And we can wear really smart uniforms, designed by Hugo Boss with a cool logo on the sleeve, and put the logo on all our stuff. Why has no one thought of that yet?! Proportional response to law breaking is fortunately not attempted murder. So they should just let them break the law? No! Better to just explode them! Yes! Because not exploding them means letting everyone in! So you want to stop them then? STOP THEM WITH DE BOMBINGS! EVEN THOUGHT HEY ARE FLEEING THE BOMBINGS! IRONY! BRONZEY! AND GOLDY! Nobody is trying to compel you to care. You’re perfectly free to be an arse and everyone else is free to call you one. Fair enough moyest. I think you will find the “everyone else” you speak of is becoming a minority though. These are ugly scenes no question. Innocent people wrapped up in horrific situations not of there doing. I am an arse though for a different opinion. An opinion you don’t really know. …You type, as you sip your soya latte at your cosy office desk or kitchen table, wondering which restaurant to book for tonight to celebrate nothing, just because you fancy treating for yourself for doing nothing in particular. Let’s say your above comment is completely true. Why is that a bad thing. Since your so condescending about people in offices drinking coffee and buying things for them selves I’m assuming your donating all your free cash and time and only buying thing that you need to just about stay a live. Oh the humanity!!!!! Yes we should all feel guilty for a crisis we had no hand in. Fair play to your innocence if you think we had nothing to do with us. Our governments, our policies, our globalised choices. This particular crisis (Syrian) has very little to do with us. Ireland. Shannon? Tenuous link. I think it is naive to think continuing down the road of facilitating people smugglers best serves everyone. Many nations in the region are far more culpable in there lack of support. It is a fact in scenarios like this places closer to the area are much more suitable. Errant nonsense. We are a social and interdependent species highly dependent on technology and medicine. If it was up to you and yours you wouldn’t have fire, let alone soup. Complete nonsense. We are not a “social and interdependent species”. It is ridiculous to think that. True , we are “highly dependent on technology and medicine” but to think access and ability to use the benefits of these things are universal is willfully ignorant. Without sociability and cooperation we couldn’t spread ideas and raise ourselves above bone rattling and spear waving. And we sit back and let the US, French, British and Russian military ensure our access to those resources, and them take he ‘moral ‘ high ground. Deluded, you seem to think our species discoveries in the fields you mention are automatically spread across the globe to help enrich mankind. That is simply untrue. You know this as it is a simple fact. You say some are more social than others, and although true, this has no real benefit past the individuals level. Give your friend in N. Korea an iPhone 6 and see how they get on. Give a friend in the DRC Pre-exposure Prophylaxis and see how long they can source/afford it. To keep pretending “we are all the same” is far more damaging than helpful and this is highlighted IMO with the refugee crisis. You cannot simply displace unprecedented numbers of people and expect it to go well based on goodwill. It seems heartless to say to some but it is rational. Hi Linbinius, we benefit as individuals from all the invisible diligence and attention to detail from all over the world that occasion our lifestyle. Whatever you may feel, services, health and education are not going to run on selfishness and cynicism. I’m confused at the reference to a repressive regime with a closed border that exalts in jingoistic pomp. I can understand the fear over the clash of cultures*. I wonder why they would reject our values. I object to your gross misuse of the word rational. *I highly recommend the series Lillyhammer in this regard. They are trying to leave Turkey though…..
As much as a zinger you feel that was it is not as relevant as you may think. Here’s a thought! Instead of giving Turkey 3Billion Yoyo’s to pocket and punish these Syrian fleeing war why not…. oh send a ferry to collect these refugees? Yep, and from the 3billion we then ‘Manage’ the crisis like reasonable people. And then instead of seeing all these real refugees go through hell looking for safety & security, we give each of them some of the 3billion…. Hold on, hold on, then how about we issue them id’s, spread them across Europe, use our media to brain wash Europeans into welcoming them and helping them! Ya, your right…. easier to be a bunch of pig ignorant racist xenophobias creating instability globally and long lasting resentment! I am not sure if you are joking. What is the sarcastic part and what is the genuine part? “easier to be a bunch of pig ignorant racist xenophobias creating instability globally and long lasting resentment!” Who are you talking about?